Plot allows importing of binary data. 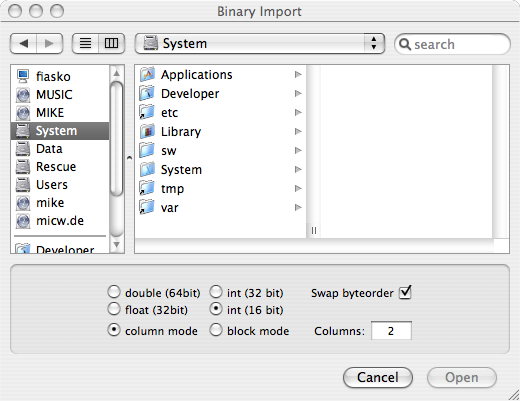 This can be done by selecting Binary Import from the File menu. In the open panel you have to select your binary file and to provide some extra informations. Data type: Specifies the type of date in your file. Valid type are double (64 bit), float (32 bit), integer (32 bit) or integer (16 bit). Import mode: Defines how the data are ordered in you file. Column mode expects data ordered in columns and Block mode expects a block for each column. Swap byteorder: Allows to swap data which are generated on a platform with different byte order. Columns: The number of columns in your file (has to be at least 1). If your file has only one column the values will be treated as Y values, the X value will be generated as sequence number. If you have more than one column the first will be treated as X value and every other column as Y value.